Good sofas with chaise set apart any living area, and as you can see in the following images, there are tremendous people showcasing how to use a sofa to set apart their living areas in many different styles. 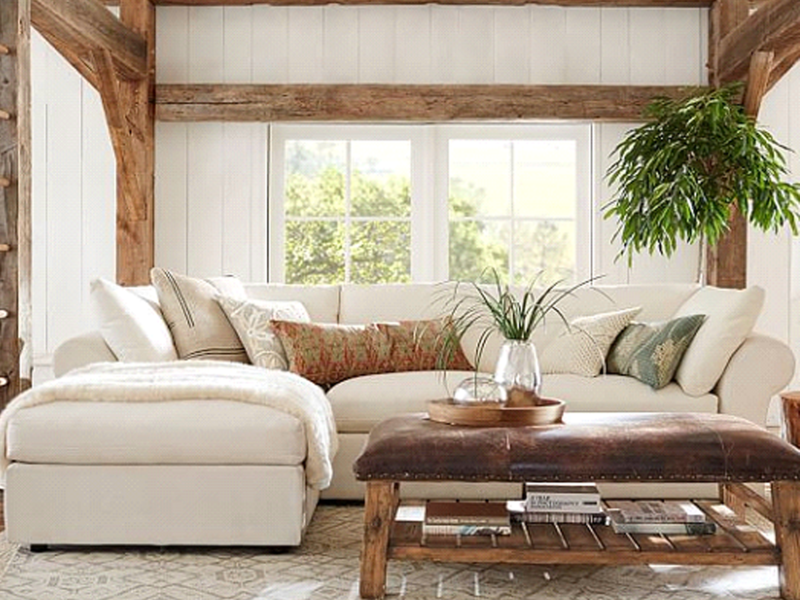 Natural elements and whites define this lovely lounge space. The bench-style coffee table and exposed wood architecture offer textural and rustic contrast to the more subdued rug, walls, and sofa. 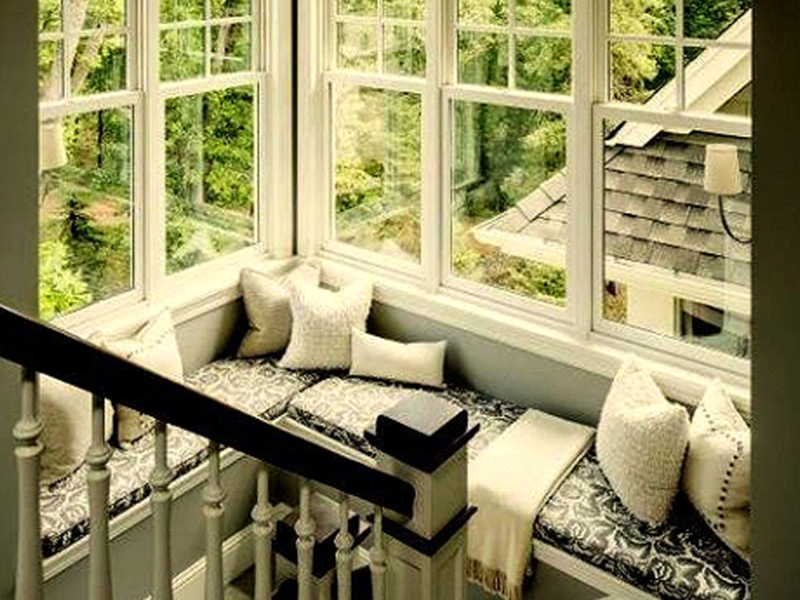 Curl up here with a book or put your feet up while you stream your favorite show. Mismatched pillows keep things casual without straying from the defined style, and the greenery indoors and out adds to the natural feel. Relax or host friends in this elegant, but understated room. The square arms of this sofa make a convenient surface for your book or drink, and add a masculine quality to the space. The low back of the sofa and short-statured coffee table leave the room itself to make a statement, with its tall windows and monochromatic walls. Use pillows soften the look, and accessories and fixtures to tie in the wood of the floor. This versatile space invites family movie night, lunch with a friend, or a place to spread out and conquer an important project. 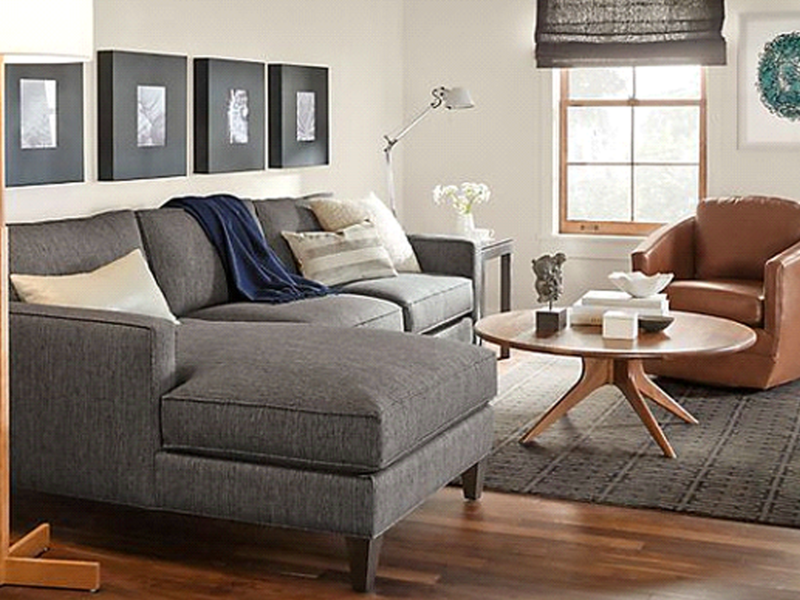 The coffee and side tables are both decorative and practical, and the sofa with chaise lounge offers comfort and style. A pair of lamps frames the space and additional interest is held by the geometric pillows framing the living space. We love the midcentury vibe in this arrangement. The arm chair offers the perfect accent to the sofa with chaise, and its naturally warm color ties in perfectly to the round coffee table, floor lamp and window. 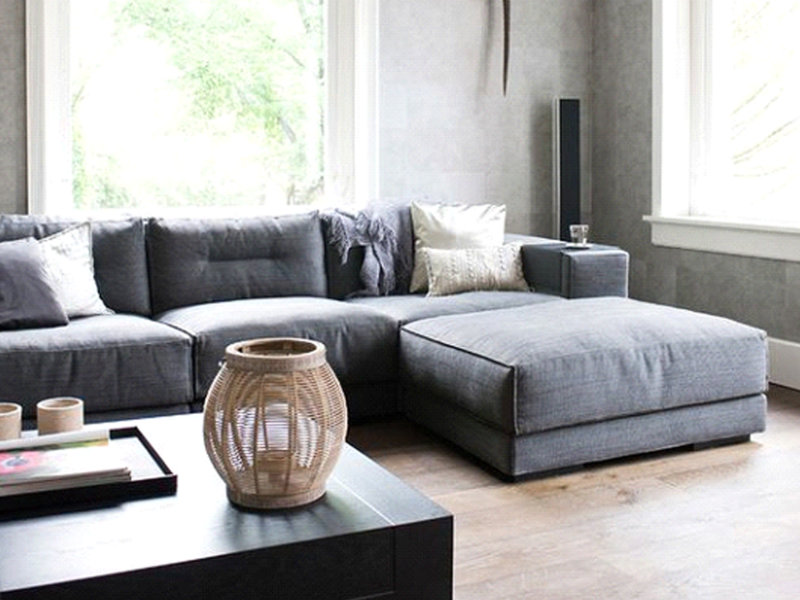 You almost can’t go wrong with the sofa’s gray upholstery, and it’s perfect in this informal living room. Add some art and unique task lighting to round out a relaxed, inviting atmosphere. When making design choices for your home, consider the windows. Size, placement, and even the view can really promote, or detract from, the atmosphere of a space. Read on to see how the uses of windows inspire the design in the rooms pictured below. Not all of us are lucky enough to have a wall of windows like this, but if you do, using natural elements and colours can make it seem as if the indoors extends out, and the outdoors in. Sofas below the windows give you every advantage of the area, and plenty of natural light to enjoy. Verdant green in upholstery and potted plants brings in some of the lush foliage, and the tones of stone and brick carry into the view. Bold pillows in sunset hues enliven the space and keep it from feeling too subdued. This welcoming alcove brings attention to the outdoors in a completely different way. The grays of carpet, wall, and shingle frame the fresh green of the landscape, and the accessories do not compete with the view. Instead, interest is added by way of texture – the patterned upholstery, the drape of blanket, the inviting fluff of pillow. Take advantage of your windows’ view by making it part of the decor of your home. The clean, straight lines of these black-paned windows and door definitely appeal to our Scandi design aesthetic. The outdoor dining set on the protected patio and the furniture indoors are well matched, and they both have the simple design and natural materials that are also found in the floor and structure itself. Enjoy visual harmony when the indoors and outdoors play well together, and are part of the same cohesive arrangement. 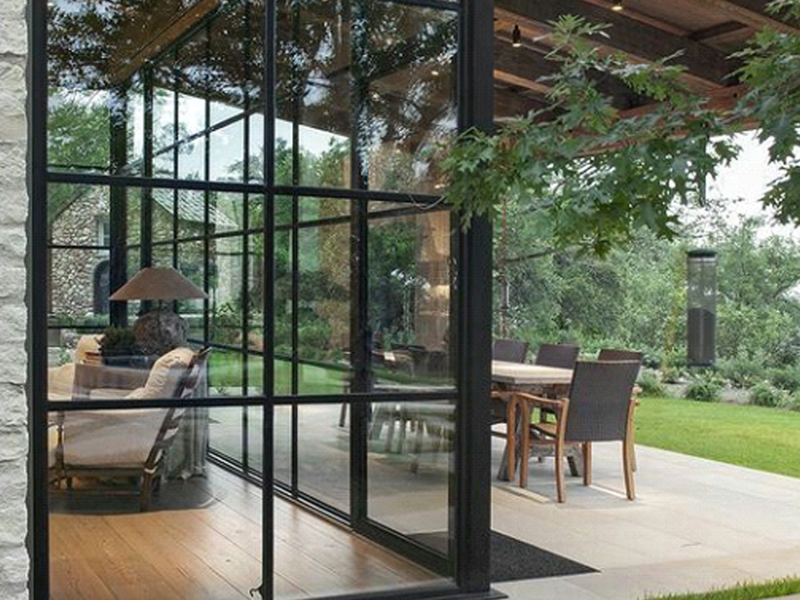 Enjoy the seamless transition from interior to exterior that windows provide? Check out these 7 Exterior Design Ideas for more inspiration! 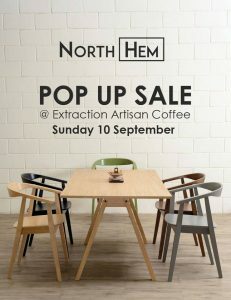 Pop- Up Sale Coming on Sunday, September 10! Is it hard to visualize showroom furniture in your own home? Do you wonder if it will serve its purpose and hold up to real use in real life? 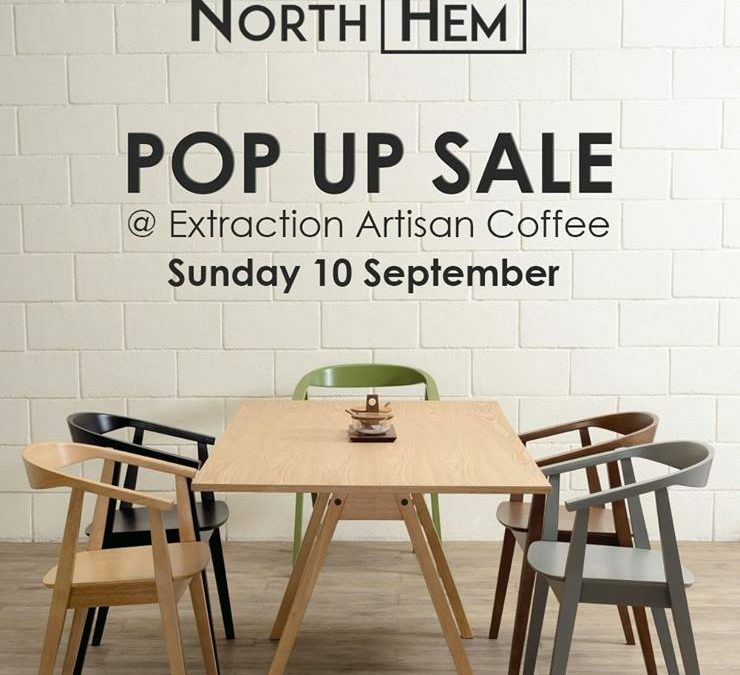 North Hem is teaming up with Extraction Artisan Coffee in Slack’s Creek to give you a chance to see and use many of our wonderful pieces at our Pop Up Sale event this Sunday 10 September, open to the public from 9:00 am to 1:00 pm. Extraction Artisan Coffee is passionate about coffee, from bean selection to the perfectly crafted cup they serve. Tucked out of the way (find them here), they offer not only fantastic coffee, but an incredible menu, with many items sourced locally. As a company passionate about design and value in our own product, North Hem is proud to feature in Extraction’s decor and furniture choices, every day. So come enjoy an unrivaled cup of coffee in our Living Showroom and browse our Pop Up warehouse sale! We will have our Mid-Century and Scandi designs available, and some items deeply discounted (like our Poppy accent chair at 40% off!). Bring your family and friends, your shopping list, and see how much you can save, without compromising on style or quality. We will also be offering great deals on discontinued living and dining room pieces, and other limited stock items. 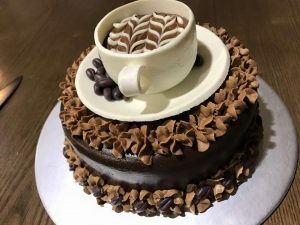 Delivery is also available. The fun begins at 9:00 am on Sunday 10 September! Don’t miss it! 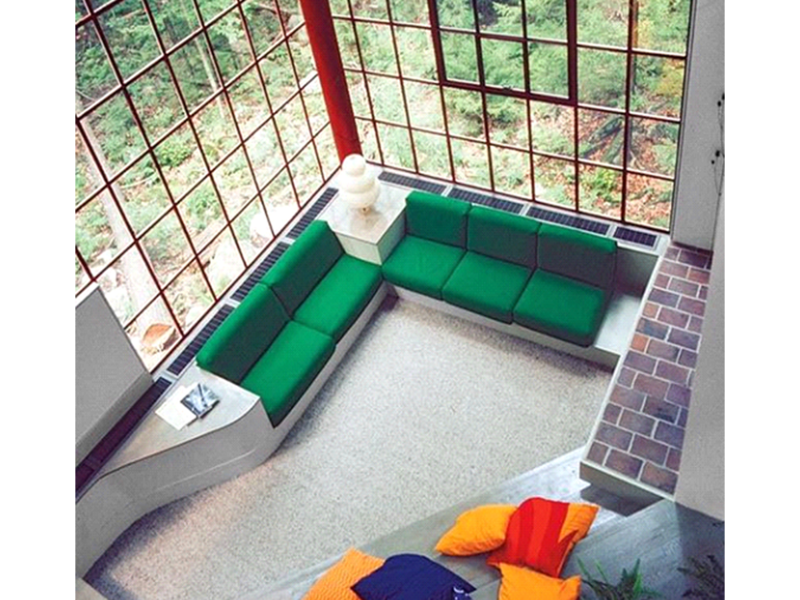 A stylish sitting area doesn’t have to require a premium of space. 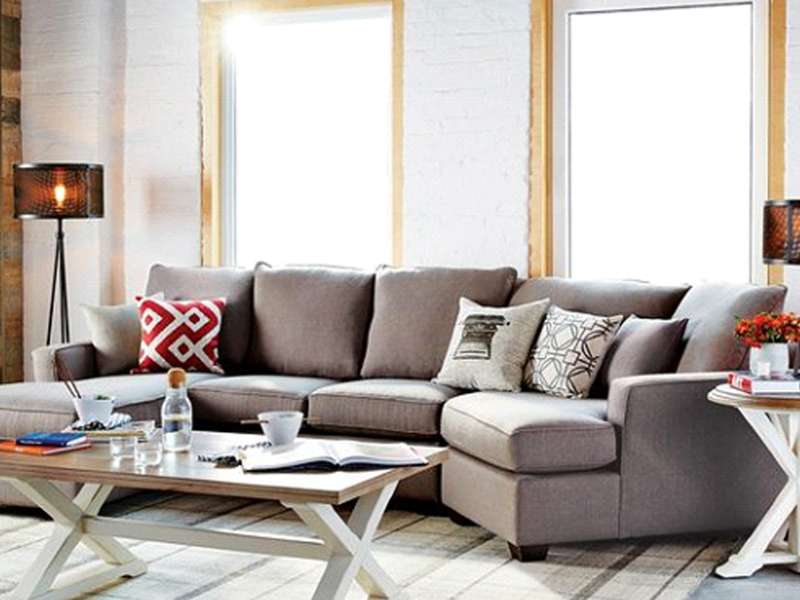 Here, a modest sofa defines a comfortable conversation area without overtaking the entire room. 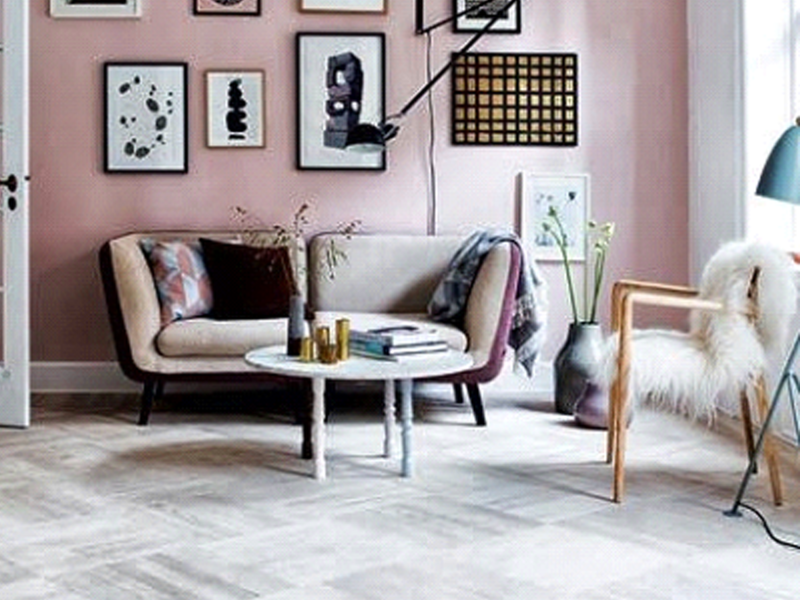 The muted pink wall sets off an art collection that ties in to the clean lines and natural materials of the modern arm chair, and the mid-century lighting and circular coffee table round out the convenience of this inviting corner. Whether you’re taking tea with a friend, or seeking a few moments of quiet reflection, this area provides just the right amenities. 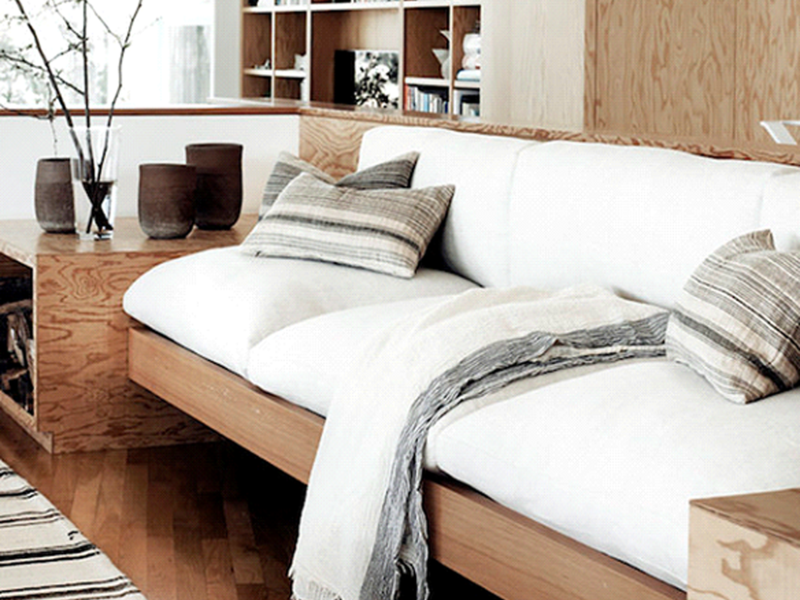 This built-in sofa helps to define traffic flow while providing a comfortable place to relax. The large window provides ample natural light, highlighting the natural textiles as well as the lovely variety of wood textures in floor, furniture, and built-in storage. The side tables and bookshelf add to the architectural styling of this space, so grab a book or your favorite music, and settle in to unwind. This simple area provides all the necessary basics for a retreat from the day’s busyness, or a place to comfortably finish up a task. The unobtrusive coffee table ties together both the monochromatic tone of the two-seater sofa and the round shape of the light fixture. The color scheme allows for myriad accents, from the neutral tones of the pillows and throw to the green of plant and flowers; even the hazy blue of the area rug. With a larger space for entertaining or family, you can use several pieces without overwhelming the room, provided it’s done right. This comfortable sofa and rug anchor and define this welcoming sitting room. The accent chair and coffee and end tables provide plenty of convenient surfaces while their minimalist structure keeps from weighing down the space. The floor brings a warmth to the palette, which is echoed in a few items, including the creative display of books. 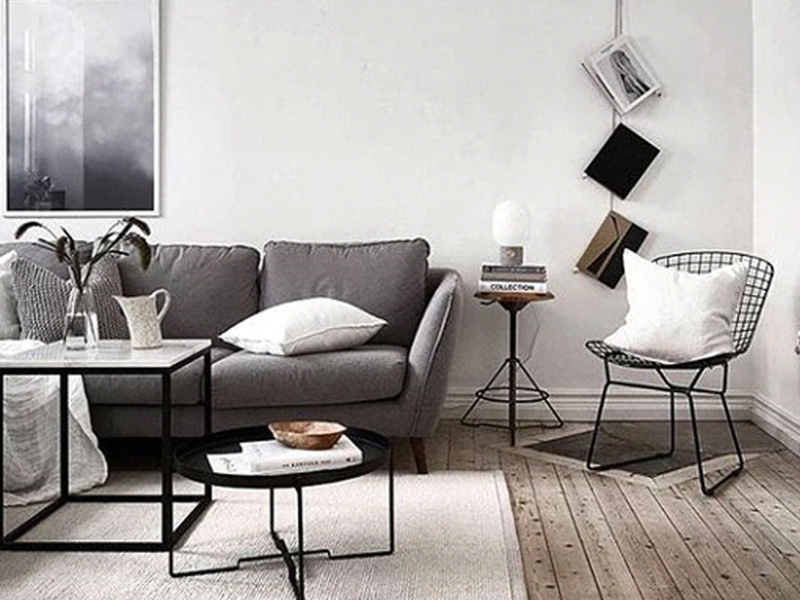 Interested in More Great Scandinavian Design Inspiration? 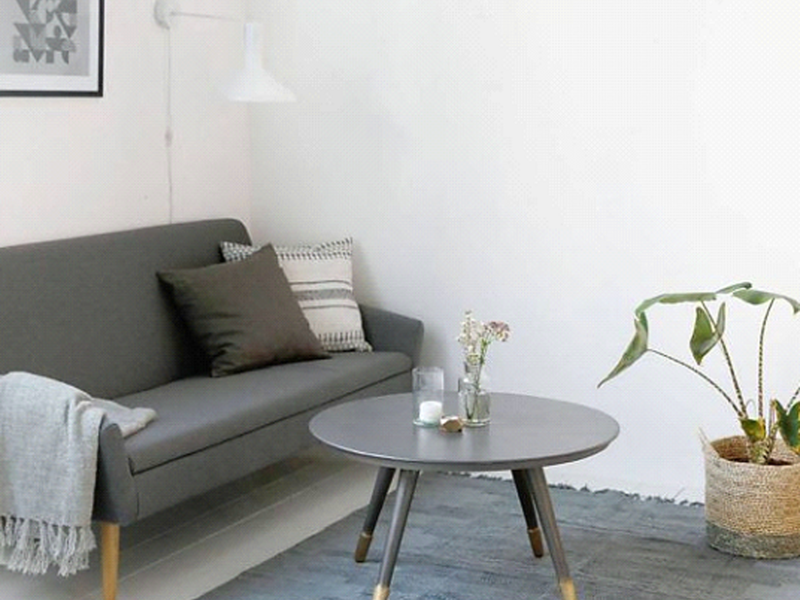 Read our geometric rules of Scandi design.